A HUGE schedule of special events March – May! In addition to over 30 Sumits classed every month, we have a full schedule of special classes coming up. See you on the mat! The original hot Bikram Yoga method, which consists of a powerful 26 posture series practiced for 90 minutes in a heated room. The 26 posture series is designed to warm the whole body, allowing students to work deeper into the muscles, tendons, joints, bones, glands, ligaments and organs while systematically moving fresh oxygenated blood to every part of the body. Ever wonder am I doing this pose correctly? Am I getting the most benefit for my body in this pose? Now is the chance to find out! Come deepen your practice get your questions answered. 3pm class included in workshop fee. Boost your metabolism and build lean muscle mass as you move to upbeat tracks. Yoga Fusion combines free weights with Sumit’s Yoga sequencing and cardio to intensify each yoga pose while mixing in strength-training moves like squats, lunges and bicep curls. Sound Bath Meditation led by Kathy K.
Guided Meditation with Gongs & Crystal Singing Bowls. Experience the transformational power of Yoga Nidra Guided Meditation, Gongs, Crystal Singing Bowls, and Reiki Magic! The Yoga Nidra will bring you into an extended state of spontaneous therapeutic meditation followed by Reiki infused Sound Healing that will ignite your chakras and vibrate all of the body’s cells leaving them radiant with health. The meditation and waves of sound will carry you to a place of peace and give you a Mind, Body, and Spirit connection. This is a 2 hour vinyasa class woven with the story of Hanuman. The postures will lead us to our peak pose hanumanasana and the mudra are designed to invoke the qualities of the hero, Hanuman. All levels welcome! No partner needed. Blend the wisdom of yoga, the dynamic power and balance of acrobatics, and the loving kindness of healing arts. This workshop will provide a safe environment to explore trust, connection, playfulness and the foundations of the yoga practice. Sumits 60 En Espanol led by Denise Ortiz. Our regular Sumits 60 express class lead in Spanish. Ven a sudar con nosotros. 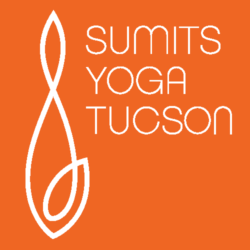 Sumits Yoga Tucson is very Proud to host 2 workshops led by Cheryl Oliver. The eight limbs of yoga presented by Patañjali are a process to refine our lives. The sequence from external to internal is deliberate, practical and profound, and each step offers us opportunities to grow and change, 5pm-7pm Beginning Chant with Cheryl Oliver $20 in advance $25 day of. The Veda-s are the foundational texts of yoga philosophy. Using the same methods of instruction that have been passed down for hundreds of generations, we will explore listening and chanting as a direct experience of tapas (intensity) and dhāranā (concentration). Yoga for Recovery with Marta Mrotek. Come check out this fusion of spiritual principles and holistic practice. Principles and the application of mindful physical movement to create the healing energy required for recovery in every area of life. Extremely useful for self study and highly effective for relieving all forms of distress. The energy moving practice is non-heated Recovery Yoga. All levels, no experience necessary. Approximately 90 minutes. Dress comfortably, (sweats, shorts or yoga attire) bring a bottle of water and yoga mat if you have one. Mala making workshop. Make your own custom mala and learn how to use it. Pre-registration in advance is required. Upon registration Kathy will contact you to select stones, guru bead and tassel color. Great way to celebrate Mother’s Day with your Mom!